The latest trilateral communiqué released by the foreign ministers of Russia, China and India has sent a clear signal that Moscow and New Delhi supports Beijing's position that the South China Sea dispute should not be "internationalized" but resolved by the parties concerned, The Diplomat editor Ankit Panda notes. A maritime dispute over the South China Sea has become a sort of political tool for Washington, which is trying to ensure its geopolitical leadership in the region. The Paracel and Spratly island chains and sovereignty over the sea areas lie at the root of the dispute between China and its South China Sea neighbors, including Brunei, Taiwan, Malaysia, the Philippines, and Vietnam. However, it seems that in the eyes of Washington the controversy caused by overlapping interests in the region is a pretext for meddling into the region's affairs, experts say. They note that the Sino-Russian rapprochement as well as the ambitious China-led New Silk Road project kicked off by Beijing became the trigger for the Obama administration's more assertive policy towards China. "I would say that the United States has intentionally created tension in the South China Sea for the last three years which led to the rapprochement of China and Russia, which nobody expected," political analyst Dmitry Babich told Radio Sputnik on April 15. Washington is acting under the pretext of protecting its Asian allies. 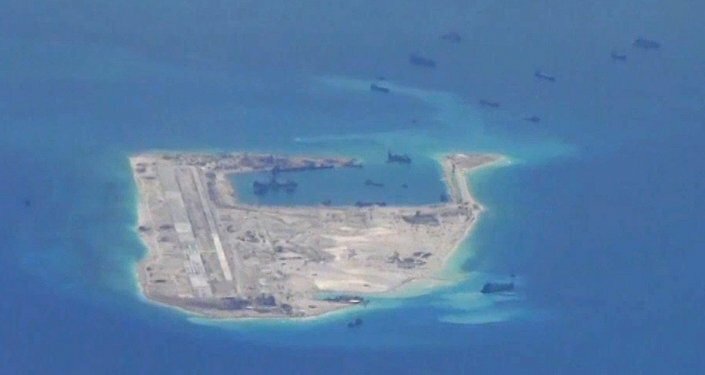 Over the last year Beijing has repeatedly come under fire from Washington for its land reclamation projects in the South China Sea. Moreover, the Pentagon has carried out a number of provocative actions in the region. To complicate matters further, US Secretary of Defense Ashton Carter announced last week that the Pentagon would beef up its military presence in the South China Sea. The Philippines, backed by America, filed a lawsuit against China in The Hague international tribunal in 2013. In October 2015 the Permanent Court of Arbitration in The Hague signaled it would hold hearings. It should be noted that China strongly opposes the internationalization of the dispute resolution, claiming that the issue should be considered by the disputing parties. In this context it is clear that Beijing needs a helping hand from its allies. "Two days ago, in Moscow, the foreign ministers of India, Russia and China released a joint communiqué outlining areas of trilateral agreement between the three countries," The Diplomat editor Ankit Panda writes in his latest article. "Russia, India and China are committed to maintaining a legal order for the seas and oceans based on the principles of international law, as reflected notably in the UN Convention on the Law of Sea (UNCLOS). All related disputes should be addressed through negotiations and agreements between the parties concerned. In this regard the Ministers called for full respect of all provisions of UNCLOS, as well as the Declaration on the Conduct of Parties in the South China Sea (DOC) and the Guidelines for the implementation of the DOC." The journalist stresses that the statement "all related disputes should be addressed through negotiations and agreements between the parties concerned" is a "nearly verbatim" wording of China's Foreign Ministry statements on the South China Sea dispute. He notes that last week, before the trilateral meeting in Moscow, Russian Foreign Minister Sergei Lavrov "issued similar remarks." Indeed, on April 12, Sergei Lavrov called to stop external interference in the regional negotiations on the South China Sea stressing that attempts to internationalize the issue were "counterproductive" and all parties involved in the maritime dispute should search for mutually acceptable agreements. Russia is known for its stance that regional conflicts and disputes should be solved through diplomatic means with the respect of the principle of sovereignty. But India's position articulated in the communiqué has caught Western observers by surprise, according to Panda. "What's striking about the Russia-India-China trilateral joint communiqué this year is that India was willing to sign on to the statement. Since 2013, New Delhi's language on the South China Sea has matched that of the United Sates, Vietnam, the Philippines, Australia and Japan," the journalist stresses. While Western observers are racking their brain over what the India's recent move means, it seems that the answer is obvious: New Delhi is demonstrating its commitment to a multi-polar word, where sovereign nations are solving their disputes themselves without an external diktat.